When Ben Redford, director and co-founder of start-up manufacturer Mayku, told us he almost put his school's ice cream vendor out of business before he was even a teenager, we knew we should stop and listen to his story. While at school, Manchester-born Ben (30) used to make so much money selling sweets to his peers that he'd employ his friends to help him carry home his takings, and his entrepreneurial flair has only grown since then. After his school told him he could only continue selling sweets if he made them himself, Ben made his first vacuum former to create them, despite claiming it wasn't great – just like his sweets! But this was his initial step towards creating Mayku's first product, the FormBox – which he's developed alongside the company's co-founder and CEO Alex Smilansky. Ben's passion has always been to invent products, and he's never been one to miss an opportunity. His drive to innovate and design was first sparked when he was a child – with him admitting he always loved taking things apart, even his toys. After school, Ben studied architecture for a year before moving on to study design at Goldsmiths, University of London. This was where he first had the idea for his revolutionary product. In a project to turn domestic machines into products which make things, he turned a washing machine into a rotational moulder. Unbeknown to him then, he was one step closer to developing his product. After graduating, he began working for a digital agency in London – but even there he was busy inventing something physical to use with the software. Ben's passion to design, invent and innovate propelled him into endless exciting projects over the course of the next few years. He created numerous successful campaigns on Kickstarter; a global funding platform, including web-connected robots Olly and Polly which could turn tweets into sweets or smells, and Projecteo – the tiny Instagram projector which could put photos from the app on to a single frame of 35mm Kodak film. His Olly and Polly project team even won the Ideal Home Inventor Award, which saw him appear live on British TV and trending worldwide on Twitter! But further down the line, on a trip to China to develop Projecteo, the final piece of the puzzle fell into place when Ben saw the traditional industrial-sized vacuum formers being used in factories – around the same time 3D printing was also taking off. So with a collection of accolades and achievements under his belt and the idea for an innovative new product, Ben co-founded Mayku along with his former colleague and friend Alex in 2015. 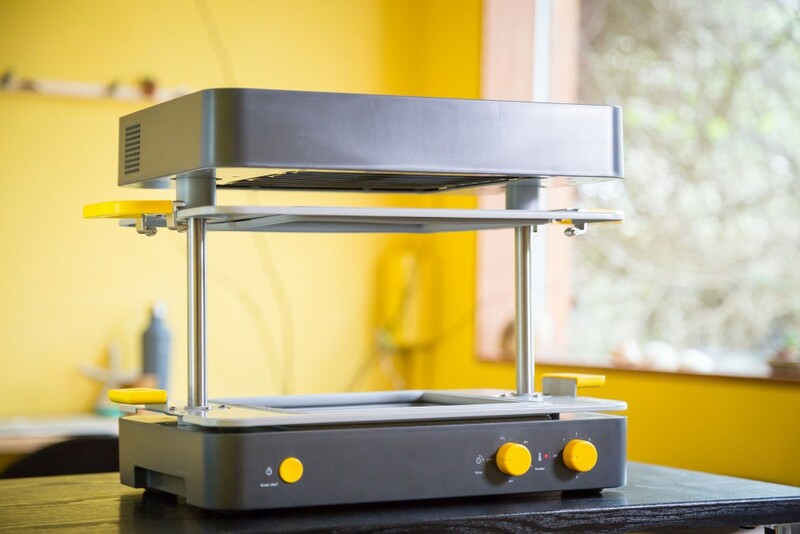 Ben and Alex finally created the FormBox; a desktop-sized vacuum former they built using a simple household vacuum cleaner and components from RS. Ben left the security of his job and convinced Alex to join him a few months later, and they spent the next year prototyping their invention at Makerversity – an eclectic shared office in the grand building of Somerset House, London. In the co-working environment of this maker space in the heart of the city, Ben and Alex worked on the fusion of design and engineering. That's when they finally created the FormBox; a desktop-sized vacuum former which they built using a simple household vacuum cleaner and components from RS. The FormBox can be used with a wide range of materials such as concrete, plastic, clay or plaster to create amazing moulds in all shapes and sizes – either for businesses, projects, prototypes or hobbies. Two-and-a-half years after founding Mayku, the business has moved to its current office in Shoreditch, north-east London. Now with a team of eight that's soon growing to 10, Ben explains they're already outgrowing their premises after only eight months. With Mayku's products being designed and developed at the head office in London, the product itself is manufactured in China. Kickstarter sold the first 1,700 FormBoxes, while a total of 3,000 are being used in the world already. Ben and Alex's inspiring determination is why we're delighted to be partnering with Mayku. We recently launched the Mayku FormBox at RS and we couldn't be more thrilled to support their ambition of giving everyday people the power to make their own things. Start transforming the way you work with Mayku's FormBox. Discover how Dave Moulds' ambition has led Team Carbide to build a champion fighting robot!